Colmberg is a romantic town in Franconia, Bavaria with a famous Staufen-era castle – now a hotel and restaurant – and a pleasant old town with half-timbered houses. Colmberg is a typical romantic Franken town with numerous half-timbered houses. 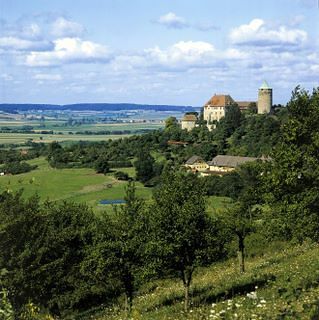 The main reason to visit can be seen from afar – Burg Colmberg that towers over the town from a hill around 50m/160 ft higher than the surrounding countryside. This Staufen castle is open to visitors and has a reasonably priced hotel and restaurant. Markt Colmberg, Am Markt 1, 91598 Colmberg, tel 09803-93-290. According to legend, there was already in Carolingian times a fortress on the hill outside Colmberg. However, the oldest references to the fortress are from the Staufen era with much of the original Romanesque structures dating from this time. In contrast to the town, the fortress survived attacks in both Margrave Wars and the Thirty Years’ War and thus has one of the best-preserved medieval defenses in Franken. The Romanesque palace received a neo-Gothic makeover during the 19th century but the 35-m/115-ft-high, round keep is the original. Colmberg town and castle are firm favorites on several cycling routes. 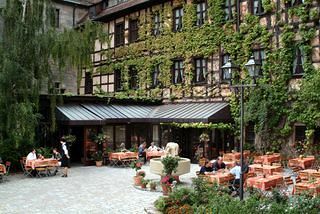 Hotel Burg Colmberg is inside the millennium-old castle. Rooms are comfortable and individually furnished in styles ranging from historic to modern. Prices are surprisingly reasonable for such romantic, historical location. The restaurant serves mostly Franconian dishes. Hotel Burg Colmberg, 91598 Colmberg, tel 09803-91-920, fax 09803-262.